Please note: There may be a longer than normal email response time on weekends. If you need an immediate response give us a call. We are a mobile operation and set up each day. For this reason, it's always good to either book online or call ahead to make sure we are set up. Take the Toronto Island Ferry to Wards Island​. 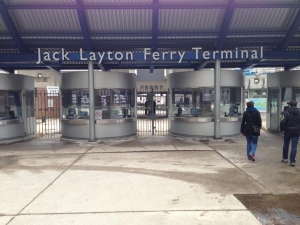 The Jack Layton Ferry terminal is located at the foot of Bay Street at Queens Quay (9 Queens Quay, Toronto, ON). Leave ample time to buy tickets at the kiosks. Buy your ticket online here to skip the line. Note the schedule changes throughout the year and for most of our operating season, you will be using the summer schedule. If we aren't at location, we are either on our way or haven't set up yet. Give us a call or book online so we know you're coming. We are a mobile operation. Toronto Harbour Water Taxi: 416 203-TAXI (8294) Pickups from foot of York Street. Tiki Taxi: 647-347-TIKI (8454) Pickups from foot of Spadina (Spadina Wave Deck).